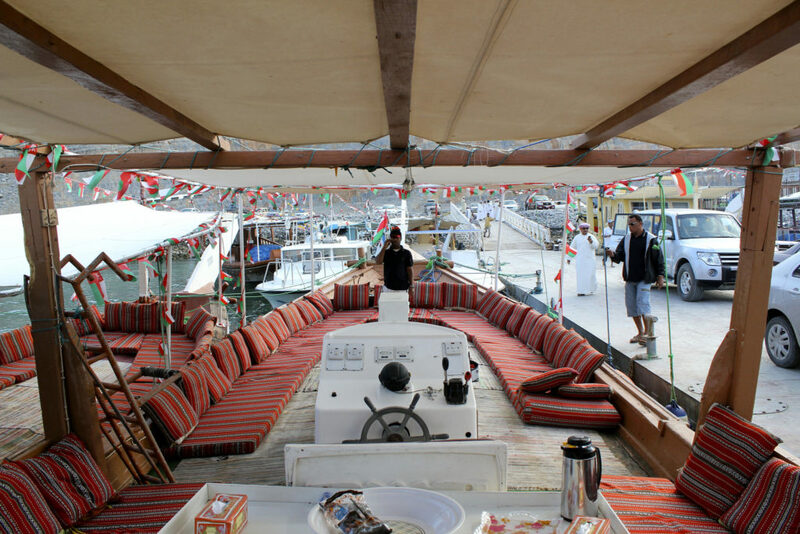 Enjoy an tremendous full day Khasab Musandam Dhow Cruise tour on our traditional Omani boat. Nature has given the Musandam Peninsula a number of foremost spectacular Creeks named to as Musandam Fjords. So spend an unforgettable day with cruising through the “Musandam Fjords” on our traditionally decorated Omani Dhow. Musandam Dhow Cruise can take you on tours in azure waters, wherever you will take nice pleasure in loving crystal clear water enclosed by dramatic mountains and peaceful remote white sandy beaches. The name “Norway of Arabia” is attributed to the region because of high stone cliffs that shelters a spectacular stream of turquoise waters and provides the possibility for serveral distinctive activities and sightseeing’s. Whereas on board throughout Musandam boat trip, we trend to take you through the set of ancient villages and a few alluring islands (Telegraph & Seebi). There is a powerful possibility you’ll see gaint cluster of Dolphins with Musandam dhow cruise trip. 10.00 AM : Departure for full day Dhow Cruise on sharing basis to Musandam Fjords. We offer lunch, soft Drinks, mineral water, tea & coffee, 2 stops for swimming & snorkeling. 4.00 PM : End of the trip and transfer to harbor. 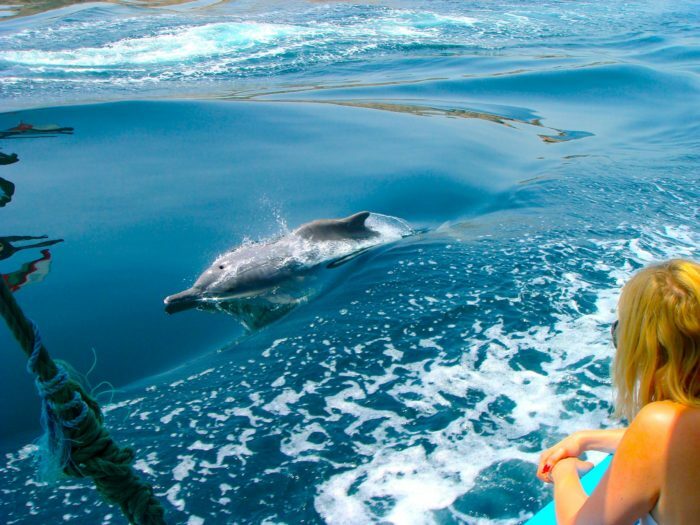 Natural and Wild Dolphin watching, snorkeling and swimming and view of fisherman villages inside Musandam fjords. We serve you on board unlimited refreshments; Tea, Coffee, Fruits (apple, orange, banana), Soft Drinks and Drinking Water. Traditional Buffet Lunch on the board includes Rice with Chicken/Fish, Salad, Hammus and Arabic bread. Snorkeling and swimming gears, life jackets, towels etc. Special Omani Qawa serve upon request. Toilet and shower facility with water, hand wash, tissue papers and towels are provided. What To Expect From Khasab Musandam Dhow Cruise? So spend a day dhow cruise within the waters of Musandam. You will get to enjoy Omani dhows that are decorated in a traditional manners. Thus you will lounge on soft carpets and cushions. Once you choose this Musandam Dhow Cruise trip, you will not only take pleasure on magnificent and sceneries. 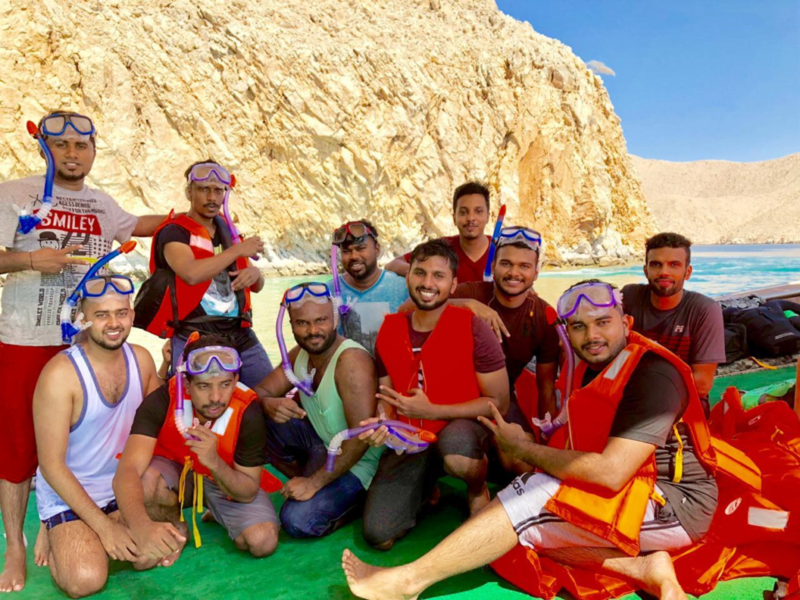 Refreshments will be included and there will be two stops to make way for snorkeling and swimming during Khasab Musandam dhow cruise tour to Musandam fjords. Dhow Cruise to the Musandam fjords (also known as Khour Shem Fjords) where beautiful, calm, turquoise waters distinction with the creamy, white limestone cliffs. Throughout the cruise we can explore small fishing villages (Nadifi, Qana, Maqlab, Shem, and Seebi) and also the famous Telegraph Island and Seebi Island, there is also a possibility to see natural and wild dolphins along the way. There will be two stops for swimming and snorkeling within the crystal clear water of Musandam. Musandam fjord has much more to entertain you. We can see mountains and feel like they are painted with a pencil. There will be small villages in the Khour will enable you to meet different cultures and amazing people. You will be surprised to see how they live in these small villages. The live on the edge of Musandam sea and spend their lives fishing within the clear water of Musandam. Full day Khasab Musandam dhow cruise leave at 9.30 am, so you must reach on time to join this tour. You will be welcome by our staff and will be served fresh fruits (Apple, Banana and Orange), soft drinks, drinking water, coffee and tea, Omani Qawa serve upon request. Dolphins are one of the most wonderful creatures on earth. Dolphins will make your day by racing the dhow if they are in a good mode, some time they follow our dhow and jump and play with as. Dolphins have playful nature and extremely social animals that love to have fun in full day Khasab Musandam Full Day dhow cruise. In Full Day Dhow Cruise the first stop of swimming and snorkeling at historical Telegraph Island. The dhow will for 1 hour anchored at famous Telegraph Island, where you can find plenty of coral growths and colorful fish. Pleasant and crystal clear water offer you perfect chance for swimming and snorkleing. Telegraph Island is also known as Jazirat Al Maqlab and one of the best place for swimming and snorkeling in Musandam Fjords. Life Jackets and snorkeling gears are available on boat. After snorkeling and swimming in crystal clear water we will serve you lunch. We provide you the traditional Omani lunch for you. Lunch may be includes fried chicken, fried rice, salad, Khubz (Arabic Bread), Hummus, fruits and soft drinks. In full day dhow cruise we provides only lunch. As soon as we serve lunch on the boat we will move towards the Seebi Island. 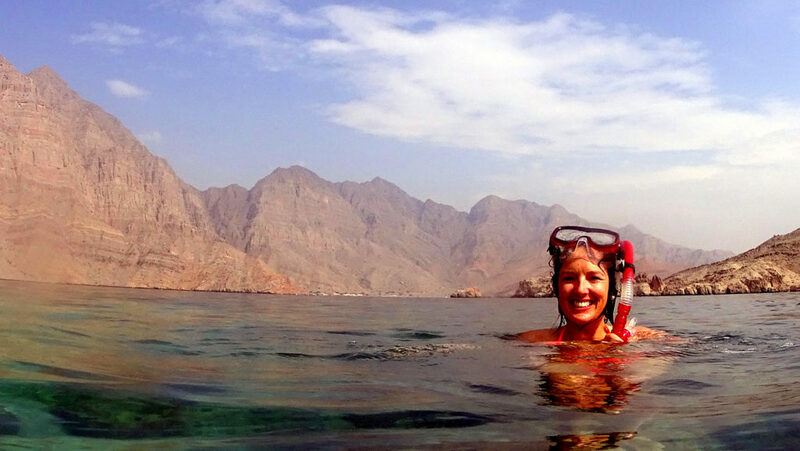 Here also we will anchor 1 hour for snorkeling and swimming inside the Musandam fjords. Seebi Island is one of the best places for swimming and snorkeling in the Musandam Fjords. And put some pieces of foods and groups for colourful fishes will come to get them its so beauty to see. We will return Seebi Island around 03:00 pm and will reach the Khasab port around 04:00 pm. The full day Khasab Musandam dhow cruise will be return to an end and it’s time to say goodbye. 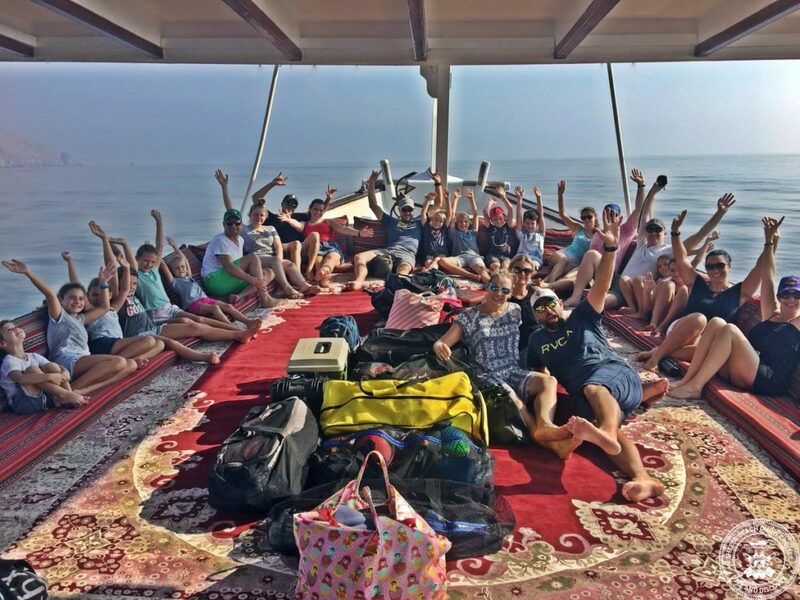 So book your full day Khasab Musandam dhow cruise today to have fun with your friends and family members and we will make sure more enjoyable every bit of your stay with us.